MineTime is a smart calendar application for Windows, macOS and Linux desktops. The application supports calendars from Google Calendar, Outlook.com, Microsoft Exchange, iCloud and any service using CalDAV, allowing you to organize all your calendars in one place. 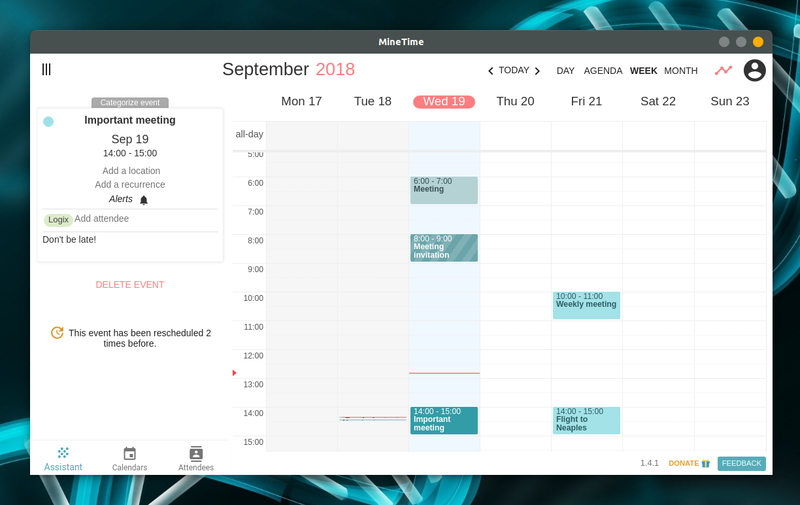 MineTime is an Electron application started as part of a research project by ETH Zurich students (a science, technology, engineering and mathematics university in the city of Zurich, Switzerland), in which it's investigated "how to bring new technologies, like Artificial Intelligence, into the daily routine in order to help people get more out of their time". Now let's get to the interesting part: MineTime features. When the left pane in MineTime displays the "What can I do for you?" text you can type the action instead of performing it manually. For example, type "Jump to December 2018" to move the calendar view to the month of December, 2018. Or type "Meeting with John next Monday at 1PM" to add a new event next Monday at 1PM. What's more, MineTime makes use of Artificial Intelligence to make group scheduling fast and easy. This is done by analyzing your daily patterns and preferences and by considering everyone's agendas as well as their preferences. 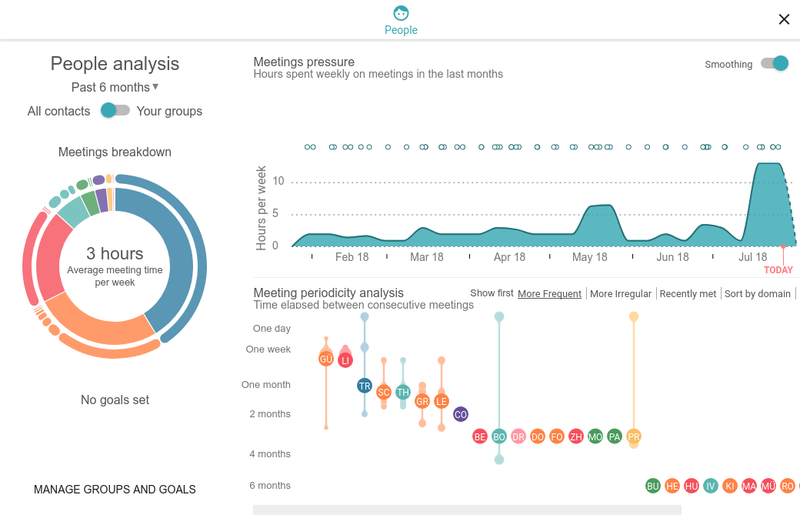 Rename calendars, move existing events between calendars, set custom calendar colors, etc. 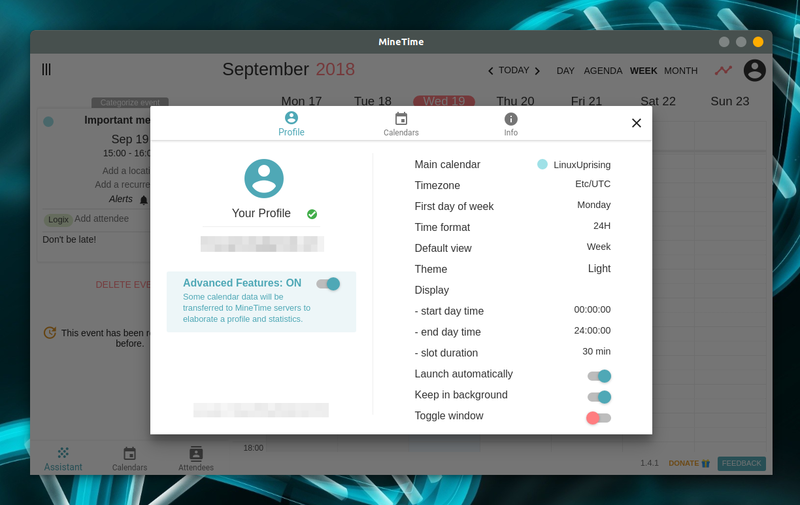 Even if you turn off the advanced features in order to disable remote data processing for privacy reasons, MineTime is still an amazing tool thanks to its support for calendars from Google Calendar, Outlook.com, Microsoft Exchange, iCloud and any service using CalDAV and, why not, its attractive user interface. The application is still missing some features though, but nothing major. One missing feature is snoozing reminder notifications, which is planned for a future MineTime release. I couldn't find a way to copy a Google meeting link either. The application is under heavy development though, with at least a new release each month, so these features will probably land in MineTime soon. For Linux you'll find 64bit DEB, RPM and AppImage MineTime binaries.